Shipping and receiving hours are 8:00 a.m. to 4:00 p.m. Monday through Friday. The address for CPI shipping is 812 West Woodside in McPherson, Kansas, off Interstate 135, 50 miles north of Wichita, Kansas and 35 miles south of Salina, Kansas. CPI has daily access to all major common carriers and contract carriers, and we are easily accessible for your own truck fleet. Central Plastics’ shipping department can ship your material palletized, in large gaylord boxes, or smaller boxes. 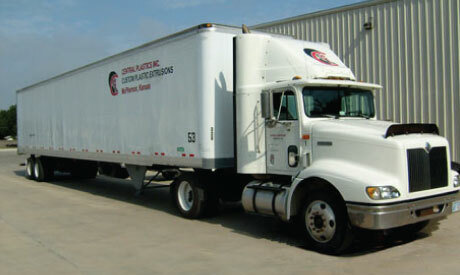 We have 3 company semi trucks and a straight truck capable of making deliveries anywhere in the Midwest.